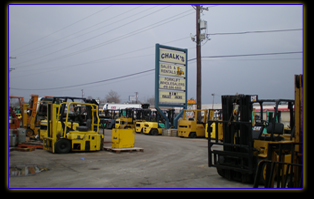 Chalk’s Industrial Equipment Sales Inc., is a family owned and operated used forklift sales and service business that was founded in 1989. Our shop is conveniently located at 8231 Pulaski Highway in Baltimore, Maryland. We started with an inventory of three forklifts and today, we have over 200 forklifts in stock. We buy, sell, rent, service, and recondition all makes and models of used forklifts in stock. We are dedicated to providing our customers with the finest used equipment available. Customer satisfaction is our goal. We will work with you personally to provide the most affordable options for your business needs. Chalk's Industrial Equipment has proudly been serving the industrial community for over 20 years. Our experience has enabled us to better serve our customers, and offer the best prices for any budget. Whether you’re looking for a quality used forklift, rental, or need to repair your own machine. We have developed a network of resources for buying used forklifts and material handling equipment. Our buying power makes it possible for us to sell our customers well maintained used equipment at fair prices.